This pattern was retired from the blog as of Monday 02/09/15 and will become available as a paid pattern only. 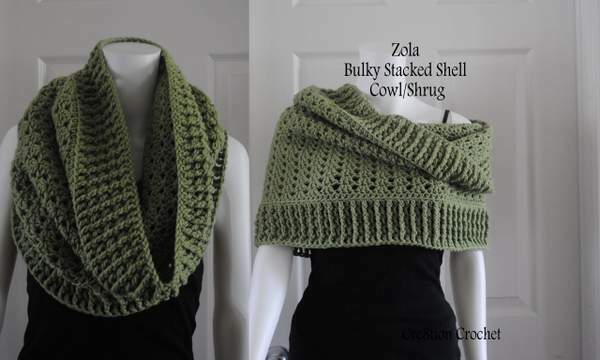 The Zola Bulky Stacked Shell Cowl is available in four sizes. This versatile pattern can be worn as a regular cowl, a hooded cowl or even as a shrug. Design features front post stitches and trinity shells for a unique textured look. Any worsted weight #4 yarn. • This pattern is written in size small, changes for medium, large and extra large are in parenthesis. • This pattern can be customized to any size. Your beginning foundation chain needs to be a multiple of 3 AND must be an even number. • Be sure you foundation chain does not twist when you join it to form a ring. I recommend removing the hook and pulling up a loop. Hold that end in your dominate hand and use your other hand to slide down the foundation chain. Line up the edges (the beginning tail should be on the bottom. Insert your hook back into the loop and slip stitch into the very first foundation stitch you created.